Chef Seni Alabi-Isama raised the culinary bar in Statesboro. Now, he’s bringing sous-vide barbecue. Seventy percent of restaurants in Statesboro are fast food chains. The Nigerian-born chef craved something more thoughtful. Seni Alabi-Isama scopes out the barbecue competition at Vandy’s in Statesboro. In the fall of 2013, a few months after opening his acclaimed restaurant Gunshow, chef Kevin Gillespie was on his way back to Atlanta from a food and music festival in Bluffton, South Carolina. As he and his wife, Valerie, drove along a desolate stretch of I-16, hunger struck. “Val, didn’t you hear about a restaurant there?” Gillespie asked as he eyed a sign for Statesboro. She had. The restaurant was called South & Vine, and it was a culinary oasis, a friend of hers had said, in a town otherwise known for serving Bud Light and burgers to Georgia Southern University students. The Gillespies were suspect—but still hungry. Twenty minutes later they entered the corner space of an early 20th-century brick building on South Main Street and examined South & Vine’s menu. They saw hangar steak with chimichurri sauce and handmade pasta including a braised oxtail ravioli. As they made their way through a double-cut pork chop with a Benton’s bacon-apple-cabbage hash, Kevin and Valerie chatted with chef and owner Seni Alabi-Isama. Until recently the Nigerian-born, Decatur-raised Georgia Southern graduate had been best known for his computer repair shop and his Muslim name. 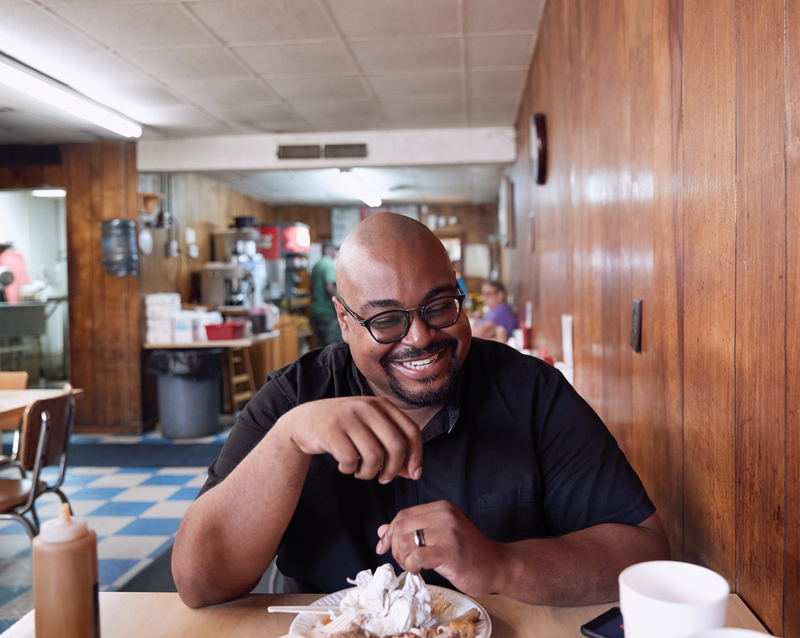 (Alabi-Isama says some who can’t pronounce it call him Seni “Habba Habba.”) Gillespie was surprised to find such refined cooking in Statesboro. This would be a good restaurant anywhere, he thought. 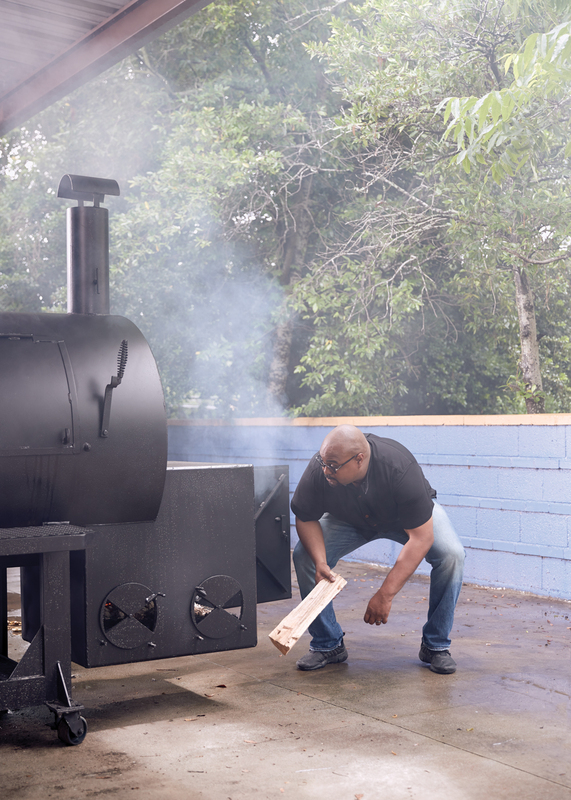 Seni Alabi-Isama fires up his smoker. Of the approximately 100 restaurants in Statesboro, some 70 percent are fast food chains. South & Vine grew out of Alabi-Isama’s frustration with that kind of culinary monotony. (He still finds himself at Panda Express more often than he’d like to admit.) He craved thoughtful food made from high-quality ingredients that reflected his wide-ranging cultural influences—his mother is Trinidadian, and he also lived in London as a child. So he started cooking. Guests lined up for the self-taught chef’s shrimp and grits, which Georgia Southern professor Dina Walker-DeVose—a self-proclaimed “shrimp and grits connoisseur”—says is the best she’s had in Georgia, “maybe anywhere.” Jimmy Carter celebrated his grandson’s graduation from Georgia Southern at the restaurant in May of 2013. 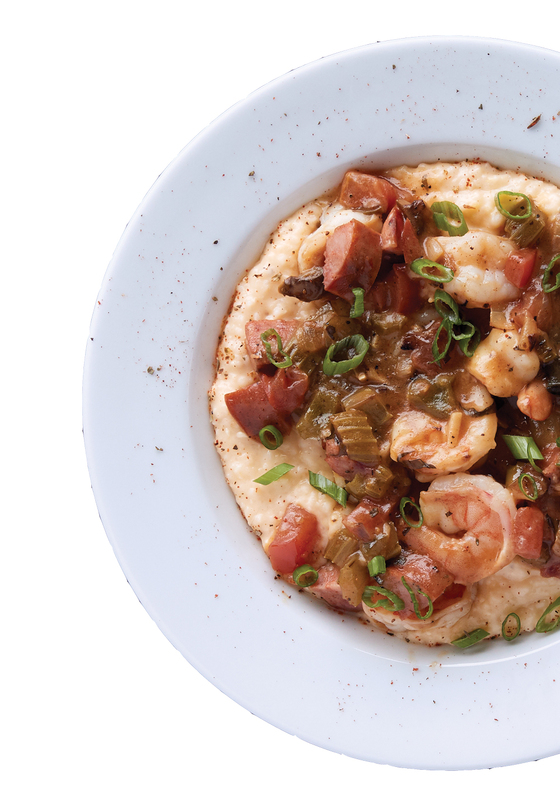 Fans of the chef’s shrimp and grits will find it at SmoQue Pit, too. Just three months after that presidential visit, South & Vine erupted in flames—an electrical fire in the ancient attic. After a period of mourning, Alabi-Isama opened 441 Public House just down the road in June 2015, with the financial help of a former South & Vine regular. At 441 Alabi-Isama raised the bar with a worldly menu, including braised octopus and beef tataki, but despite local fanfare for his shrimp and grits, the investor grew impatient before the venture could become profitable. In July 2016, 441 Public House closed. Last September another perhaps more deeply pocketed local fan approached Alabi-Isama. “All I know is, I need to eat,” he said, handing over the money for Alabi-Isama to get started on the SmoQue Pit. Had this second benefactor not appeared, Alabi-Isama says he would have moved somewhere with a more vibrant food scene. (And, perhaps, more black-owned restaurants; he knows of only one other in Statesboro.) Given a third chance to elevate local cuisine, however, he couldn’t resist. Alabi-Isama had never smoked a whole hog until last summer, but that didn’t worry him. He’d been experimenting with a low-temperature controlled vapor oven akin to a sous-vide machine, and had discovered that incorporating the modern technique would remove 70 percent of the labor and improve consistency, one of barbecue’s hobgoblins. At the SmoQue Pit, he’ll smoke brisket, pork, chicken, and other meats for four hours—about a quarter the time of traditional pit barbecue—over pecan wood in the 500-pound capacity smoker on the restaurant’s back porch. 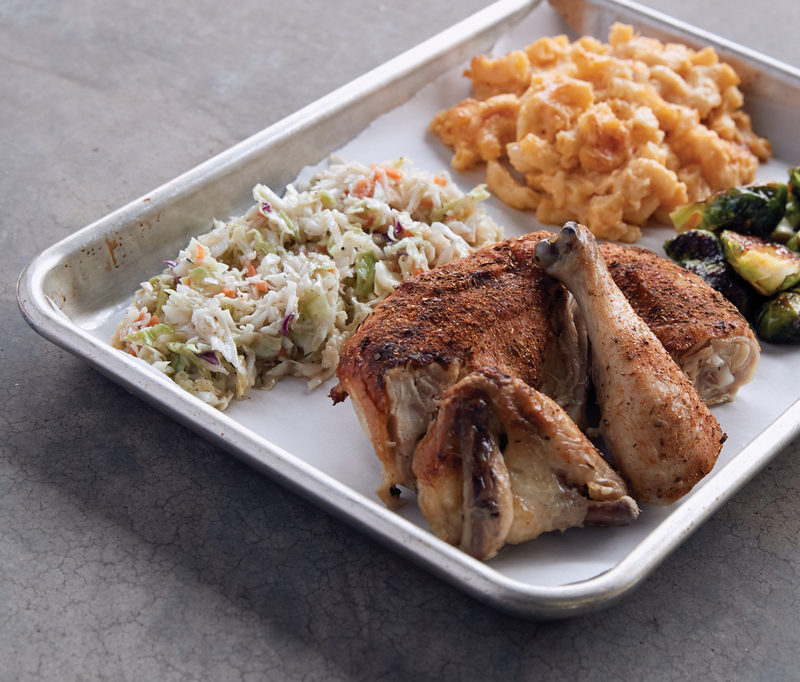 Then he’ll put all but the chicken (fully cooked in the smoker) in the vapor oven until it’s ready to serve, resulting in ultra-moist meat that melts in your mouth, a kind of carnivore’s butter with indelible notes of smoke and wood. Gillespie says he knows exactly where he’s stopping on his return from South Carolina this year.